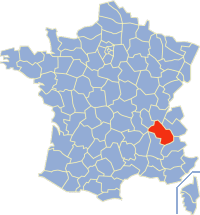 The following is a list of the 533 different communes of the Isère département, in France. (CUB) Agglomeration community of Grenoble Alpes Métropole, created in 2000. (CAVI) Agglomeration community of Pays Viennois, created in 2002, also partly in the Rhône département. (CAVO) Agglomeration community of Pays Voironnais, created in 2000. (SANI) New agglomeration syndicate of Isle-d'Abeau, created in 1984. This page was last changed on 20 November 2018, at 16:29.